While summer is great in so many ways, it can also be a hard time of year since your body may be more on display. For many of our clients, wearing shorts are a struggle since they are self-conscious of their thick ankles, varicose veins, and jiggling thighs. Sleeveless shirts display saggy arms, and bathing suits bare all our stretch marks, cellulite, and soft bellies. 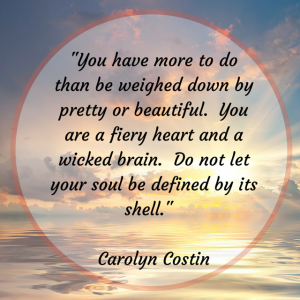 It can be tough to remember that our body is simply just a shell. Our body, our size, and our weight does not tell the story of who we are as a person or our health. This summer, dress comfortably in clothes that fit your body. Wear beautiful sarongs and sundresses. Remember that virtually no one actually enjoys strutting around in a bathing suit unless you are a swimsuit model who knows their already perfect photos will be airbrushed. Live a great summer and refuse to miss out on awesome activities such as swimming with your kids or wearing cooler clothing that displays your legs and arms.